Sumit J. Darak received his Bachelor of Engineering (B.E.) 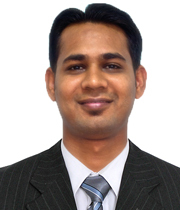 degree in Electronics and Telecommunications Engineering from Pune University, India in 2007, and PhD degree from the School of Computer Engineering, Nanyang Technological University (NTU), Singapore in 2013. He is currently an Assistant Professor at Indraprastha Institute of Information Technology, Delhi, India. Prior to that, he was working as Assistant System Engineer in Tata Consultancy Services (TCS), Pune, India from September 2007 to December 2008. From August 2011 to November 2011, he was visiting research student at Massey University, Auckland, New Zealand. From August 2012 to January 2013, he worked as an intern at EADS Innovation Works (Airbus), Singapore. From March 2013 to November 2014, he was pursuing postdoctoral research at the CominLabs Excellence Center, Université Europèenne de Bretagne (UEB) and Supélec, Rennes, France for the project GREAT: Green Cognitive Radio for Energy-Aware Wireless Communication Technologies Evolution. Dr. Sumit has been awarded India Government’s ‘DST Inspire Faculty Award’ which is a prestigious award for young researchers under 32 years age. His research interests include design and implementation of multistandard wireless communication receivers as well as application of machine learning algorithms and decision making policies for various wireless communication applications. Green Information and Communication Technology, Advanced digital system design, Advanced digital signal processing.